Two exceptional sheep businesses have been unveiled today (Monday 5 November) as the finalists of the AgriScot Scottish Sheep Farm of the Year award, by AgriScot, Quality Meat Scotland (QMS) and award sponsors, Thorntons Solicitors. The finalist farms – from the Borders and Perthshire – were selected from a very strong line-up of nominations this year. Whilst the businesses themselves are quite different, both are run by producers dedicated to producing first class, quality assured sheep and lambs. The finalists farms are Bowhill Farming in Selkirk managed by Sion Williams and Incheoch in Alyth run by Neil and Debbie McGowan. Both farm businesses share a commitment to constantly looking for ways to improve productivity and efficiency. The aim of the AgriScot Scottish Sheep Farm of the Year Award is to showcase excellence in sheep production in Scotland and to raise the profile of the dedication of the Scottish sheep farmers who produce Scotch Lamb PGI. The recipient will receive a £500 cheque as well as a £250 voucher to celebrate their success at a Scotch Beef Club restaurant. The club, run by QMS, has around 150 members committed to serving top quality Scotch Beef PGI. The award recipient will be revealed on at AgriScot on Wednesday 21 November. The announcement will be made at noon in the main ring. The assessors for the award this year are Hamish Dykes, AgriScot board member, Dr Heather McCalman, Knowledge Transfer Specialist at QMS and Charley Walker, recipient of AgriScot Scottish Sheep Farm of the Year 2017 award. Hamish Dykes said that both businesses were incredibly impressive and that the assessment process this year will prove very challenging as a result. “It is important that AgriScot showcases the best in Scottish sheep farming. We had a large number of nominations this year but the two finalists which have been selected – Bowhill and Incheoch – really shone among the nominees said Mr Dykes. Dr Heather McCalman added that the assessors were looking forward to visiting both farms later this week, where they will look for evidence of a high standard of technical and financial performance, uptake of new ideas to improve efficiency and profitability, a high level of health and welfare and a keen eye on the market for the end product. The assessors will also look to gauge the passion and enthusiasm of the farmer, and any family and staff who may also work on the farm, to efficiently produce high quality animals. All farms producing lambs destined to be used for meat sold under the Scotch Lamb label were eligible to apply for the award and accordingly they were also required to be members of QMS’s farm assurance scheme. Bowhill Farming is a 5,643 hectare farm near Selkirk and forms part of the Borders Estate under Buccleuch. It runs 6,800 ewes as well as 500 suckler cows, over 100 red deer and an Anaerobic Digester and is managed by Sion Williams and his team of ten employees and three apprentices. The hill flock at Bowhill consists of 3,850 Scottish Blackfaced and 1,600 South Country Cheviot breeding ewes. They are grazed on 4,249 hectares of heather moorland and produce replacements for the in-bye flock. Of the hill flock, 66% are put to pure bred Blackface tups and the remainder are crossed with Innovis tups. Ewes lamb outdoors and rear an average of 112% lambs, which are then sold deadweight to Dunbia in the Sainsbury’s supply chain when prime. Bowhill also has 1,350 crossbreed ewes (mainly Aberfield crosses and Aberdale crosses) which produce prime lambs, again for Sainsbury’s. This flock is managed in an intensive system with ewes housed from January and fed through a TMR system and moved out of housing as they lamb. This flock successfully rear 174% of lambs. The farm also produces Abermax and Primera rams, which are either used for breeding or sold, and finishes 4,500-5,000 lambs each year. 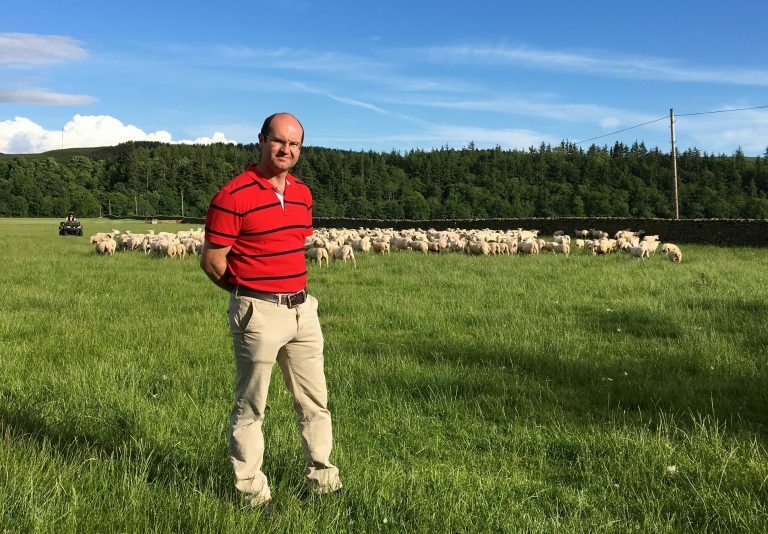 Bowhill is dedicated to improving the genetic performance of its flock and the performance of ewes and prime lambs is monitored using EID technology. The farm is also involved in the Ram Compare project which compares ram performance across terminal breeds. Having recently become a Linking Environment and Farming Demonstration Farm, Bowhill has a balanced approach to managing day to day activities as well as ensuring attention is given to the environment it farms within as well as engaging with the public. The farm is also an Agri-Epicentre Satellite farm for the project using various innovations on farm. Incheoch is a 485-hectare upland farm at the foot of Glenisla, near Blairgowrie farmed by husband and wife team Neil and Debbie McGowan. Together in partnership with Neil’s parents Finlay and Judy and sister Clare, they run a low-cost sheep system in terms of capital and labour, along with a suckler herd. The farm uses EID technology and EBVs to help produce ‘functional, efficient and robust breeding stock’. The McGowans are dedicated to improving the genetics of their flock and enhancing the commercially relevant traits, particularly maternal characteristics. 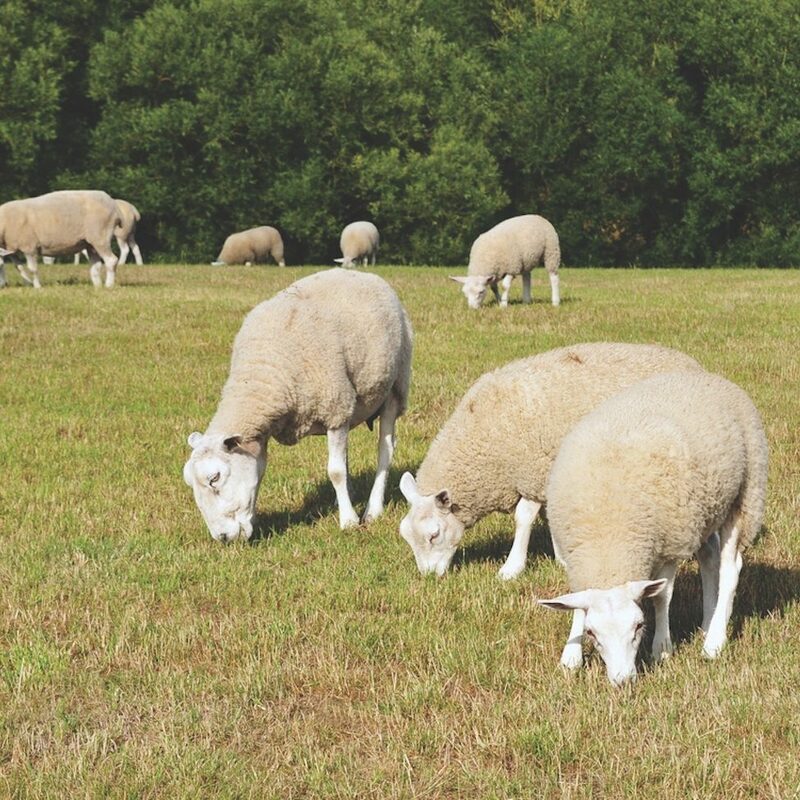 The foundation of the sheep business is prime lamb production, however they have been selling grass-fed, performance recorded Lleyn and Texel rams at an on-farm sale for the last 11 years. Of the 1,100 Lleyn ewes, the best performers are bred pure for replacements with the remainder put to Texel tups for prime lambs. 100 Texel ewes breed rams for their own use and to sell. Prime lambs are sold to Woodheads averaging 20.2kg. Working with a local abattoir and butcher, the McGowans also sell 30-40 of their lambs direct to the public each year in bespoke retail packs. Lambing is outdoors in April / May with minimal intervention. To help achieve an easier to manage outdoor lambing flock, performance records have helped achieve a reduction in scanning from 204% to 189% over the last 10 years, improving lamb survival rate to 83%. Incheoch also has 180 Luings (half bred pure and half to the Simmental bull), another 40 Simmentals and a handful of Angus kept for bull production. AgriScot, the farm business event for all farmers and all sectors takes place at Ingliston, Edinburgh on Wednesday 21st November 2018. Thorntons Solicitors has been recognised as one of the leaders in the field of Rural and Agricultural Law in Scotland and have grown to become one of Scotland’s largest legal firms. Thorntons offers a complete service for rural property, business and personal matters. Our team are an active part of the rural community. Thorntons rural team advise farmers, land owners, rural businesses and land agents. QMS is the public body responsible for helping the Scottish red meat sector improve its sustainability, efficiency and profitability and maximise its contribution to Scotland’s economy. QMS promotes the PGI labelled Scotch Beef and Scotch Lamb brands in the UK and abroad and promotes Scottish pork products under the Specially Selected Pork logo. Please note that the use of the word Scotch in the Scotch Beef PGI and Scotch Lamb PGI brands is correct and should not be substituted for an alternative such as Scots or Scottish. The history of the use of the word Scotch in this way, traces back to the 18th century. The quality assurance schemes run by QMS cover more than 90% of livestock farmed for red meat in Scotland. They offer consumers in the UK and overseas the legal guarantee that the meat they buy has come from animals that have spent their whole lives being raised to some of the world’s strictest welfare standards. Scotland’s beef, lamb and pork producers make an important contribution to the country’s economic, social and environmental sustainability, contributing over £2 billion to the annual GDP of Scotland and supporting around 50,000 jobs (many in fragile rural areas) in the farming, agricultural supply and processing sectors.